Looking for some fine reading to look over while enjoying a cup of tea? 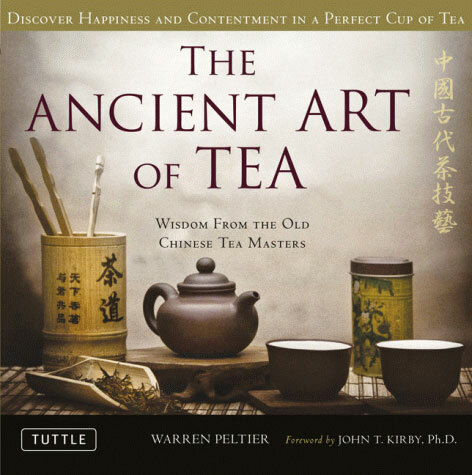 Consider The Ancient Art of Tea: Wisdom From the Ancient Chinese Tea Masters by Warren Peltier. In it you will learn that “…mountain water is superior. Inferior is river water. Well water is inferior to river water.” Which makes sense. Naturally. Fine tea leaves and resplendent utensils are only two elements of what is a dynamic process to fully enjoy tea. However, without skill in steeping tea, without a suitable environment to drink tea, without good spring water, without proper fire to boil water, without an understanding of tasting tea, such exquisiteness of tea leaves and utensils effectively become useless. The Ancient Art of Tea contains vital information to assist tea drinkers in their quest for yet another pot of delicious tea. This book teaches the two fundamental secrets to tea as practiced in ancient China—technique and taste. These exemplify some of the basic concepts of the philosophy of tea, which greatly enhances tea enjoyment. Not only an exhaustive source of tea knowledge, The Ancient Art of Tea is also a very important volume in the study of Chinese tea and is sure to become a classic in itself. Warren Peltier is the Director of the Chuan Ming Chadao Tea Culture Research Center and well-known tea expert. As a researcher, author and lecturer he has studied the way of tea for over 18 years.